BenQ’s pro-grade eSports brand Zowie has been steadily accruing both product and reputation over the last few years. Their XL2546 offered up some really interesting innovations and performance gains in cutting-edge picture quality. 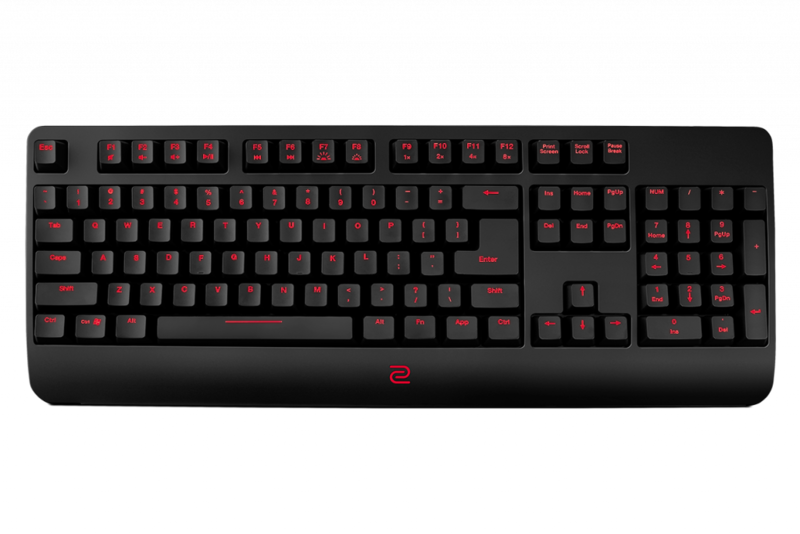 Now, the Celeritas II eSports keyboard promises to round out the range with a product that reflects the same sensibilities. 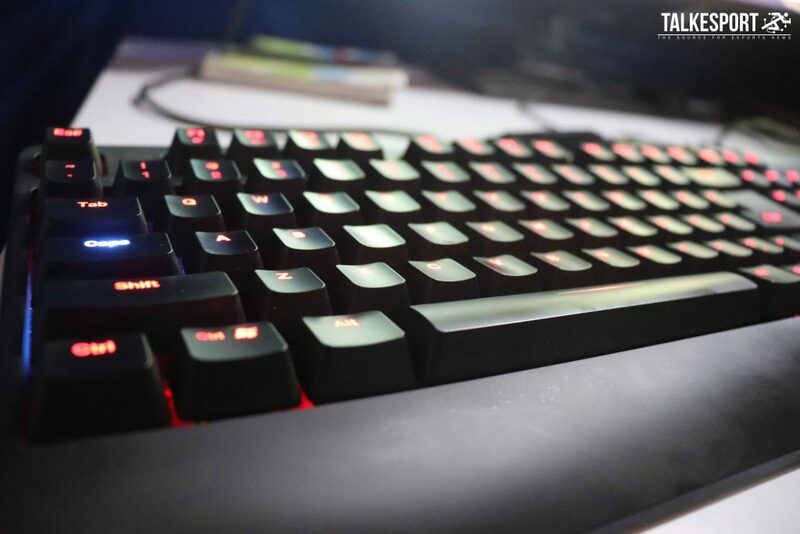 Regardless, it does manage to stand out from the rest of the gaming keyboard pack. Sure, at first glance, it does hold some aesthetic similarities with the kinds of products available through existing gaming brands. However, the big difference is that BenQ have opted go with an optical solution rather than a purely mechanical one. Before discussing the product, I want to highlight one interesting thing that I discovered when removing Celeritas II from the package. The product sales bundle is actually quite simple. What I found unusual is the presence of a USB adapter to PS / 2. 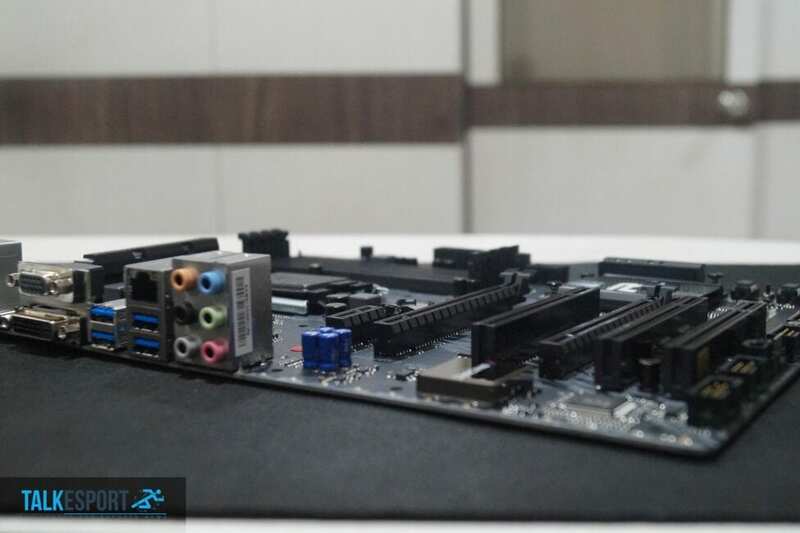 Various motherboards still continue to use these six-pin ports, but you might not be able to find them in modern laptops. And BenQ has a special purpose in providing it, discussed further below. 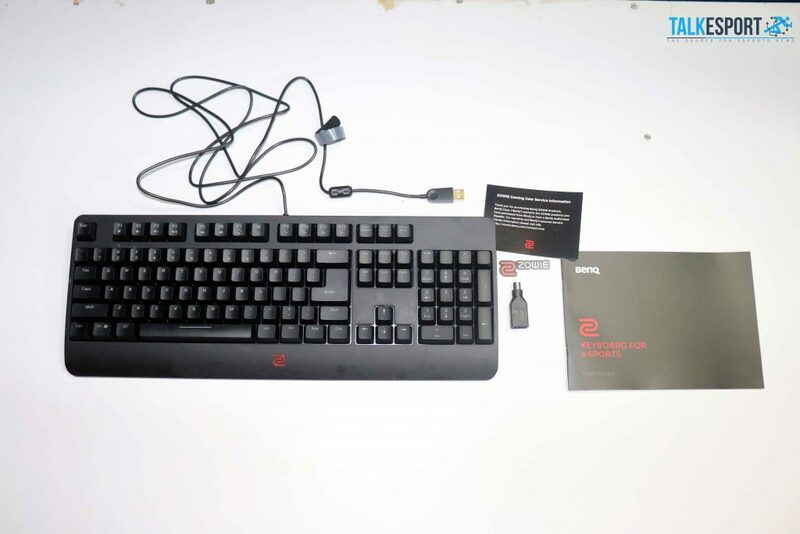 Zowie Celeritas II is a full-size layout keyboard. The presentation is very simple, it only presents essential elements. 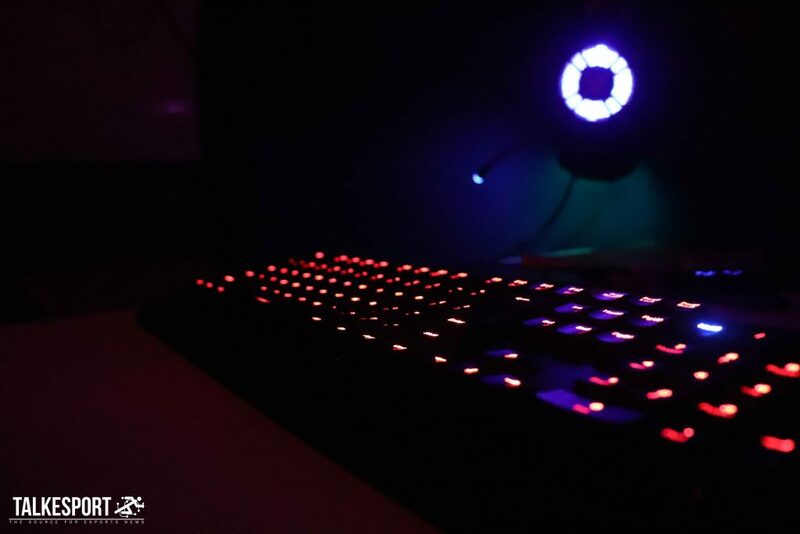 The device carries a box body and a rounded edge with dimensions of 44.2x17x3.8-centimeters, then its appearance is sweetened by the presence of the red LED backlight and the Zowie logo in the lower middle area. The lighting system does not yet use RGB but is equipped with a bluish white colour on a number of buttons – for example Caps Lock, Num Lock and Windows Lock – as an indicator of the current function. 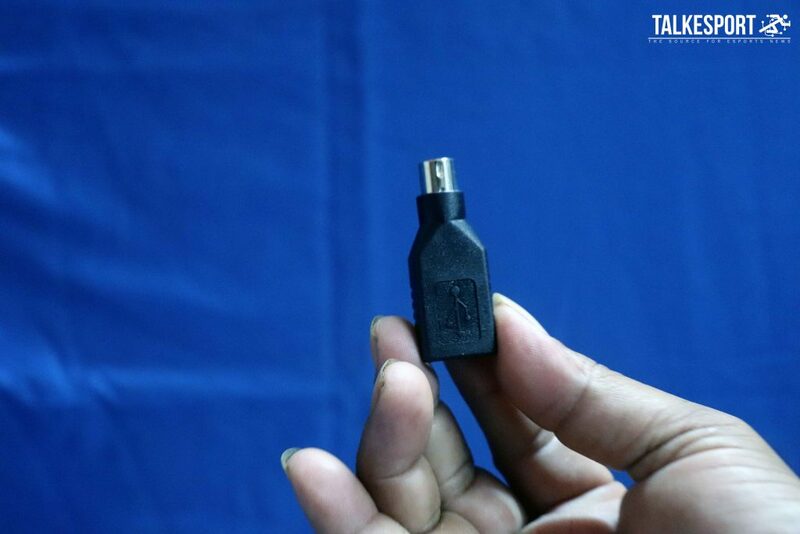 With this design approach, there is no more LED indicator light except in the keys area. Celeritas II also does not have a multimedia function settings button and a dedicated LED brightness level setting – this is done via the Fn and F1-F6 key combinations. Another uniqueness in the design aspect is the absence of a wrist rest (as well as the absence of an expansion slot) and adjustable feet (there are only four anti-slip rubber extends at the bottom). You cannot raise the back of the keyboard, and in use, you can only place your palms on the table. As a solution for finding the most comfortable position, you need to adjust the height of the bench. Celeritas II’s body is made of plastic, and there Zowie implements a doff coating. The coating feels smooth when the hands or fingers touch it, but the weakness is that this type of surface will become a hotbed of stains and dirt in a short time, so you must always keep it clean. If not cleaned frequently, oil from the fingers (or food) can make the surface become shiny. 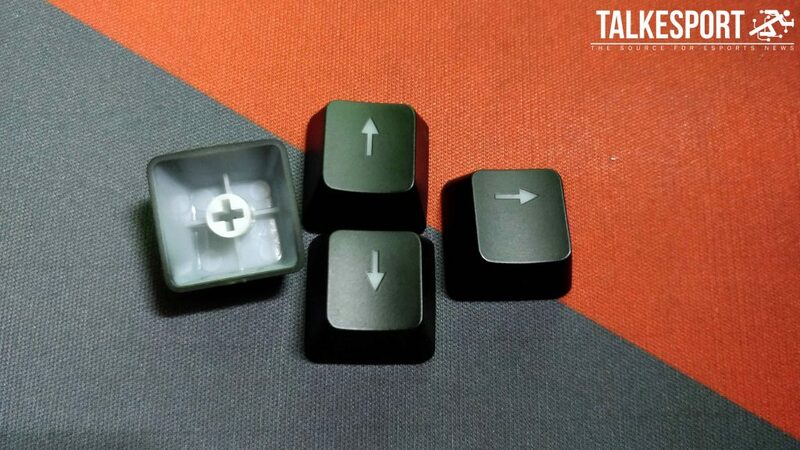 When the Celeritas II button is pressed, the stem under the keycap will move down, after which it immediately returns it to its normal position. The difference is, it uses light as an input medium – not an electrical signal. When you press the button, the prism part goes down and directs the infrared to the receiver unit. The concept works as a trigger button on the controller Xbox One and DualShock 4. Through this method, the Flaretech optical switch can minimize error rates and avoid double keystrokes (one press but twice registered). Optical switches do not use toggles but measure the movement of buttons. 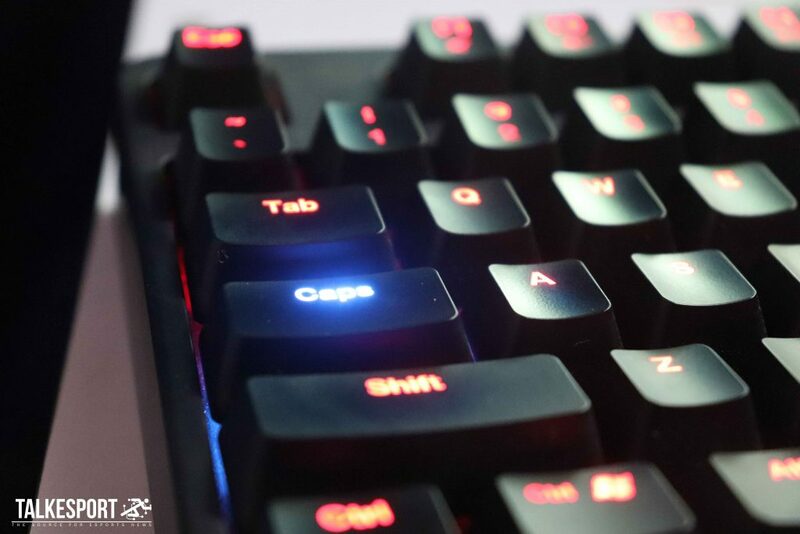 On ordinary mechanical keyboards, oxidation of the actuator as the keyboard age increases can interfere with input, then the complexity of metal components also has the opportunity to increase the delay in sending signals from the keyboard to the PC for several milliseconds. Celeritas II itself has only one moving component: per. In addition, there are only infrared emitters and receiving units. 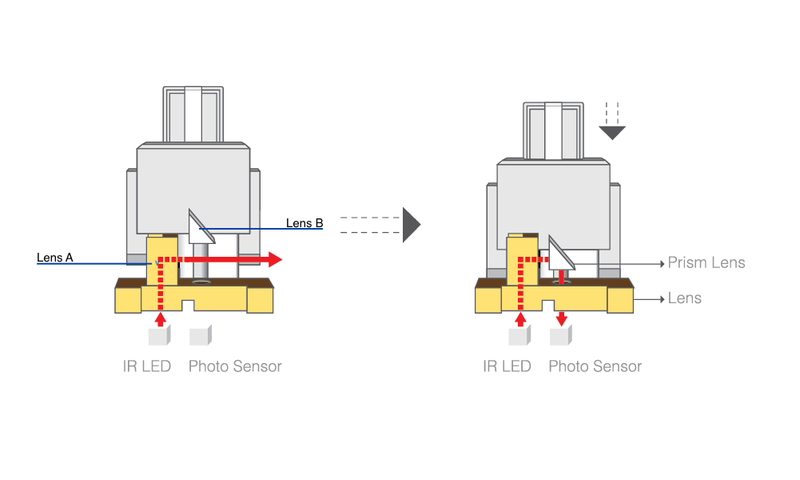 In order to work perfectly, Zowie configured Celeritas II firmware very carefully so that the keyboard could precisely determine the infrared light intensity needed to activate/deactivate each button. However, because it is very complex, currently the user has not been allowed to customize it himself. Celeritas II is a pure plug-and-play concept keyboard. All functions are presented without the need for a driver and they are not supported by a special companion application. Celeritas II can work as soon as you plug it into a computer, but in this way, we can’t tinker with LED lighting patterns – only can adjust the level of information. And this is why the USB adapter to PS / 2 becomes a crucial element. 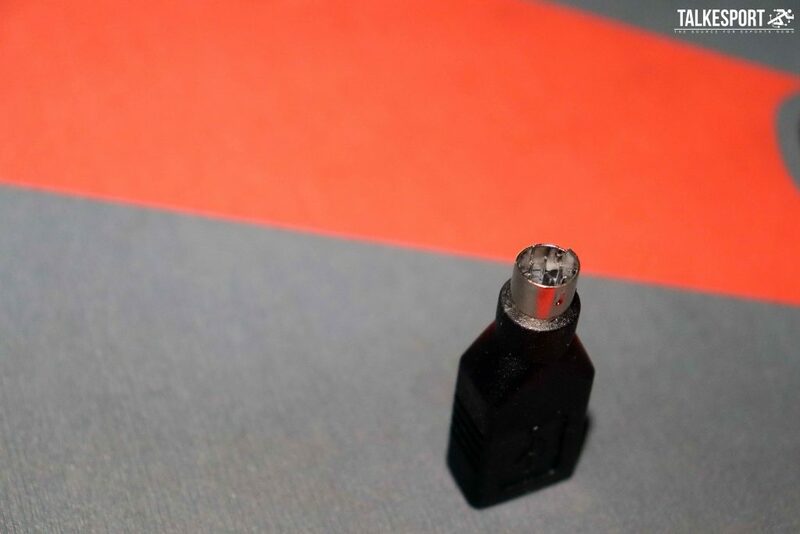 Pair this accessory if your system has a port and Celeritas II is able to provide true N-key rollover or anti-ghosting features without emulation. It is able to read every input no matter how many buttons are pressed or how fast you type. The use of the PS / 2 interface is optional, but can be very essential for eSport athletes. And by utilizing this interface, you can change the input speed. In addition to the normal option, button registration can be jacked up to twice, four times or eight times faster. This capability is reportedly very useful in maneuvering in a number of old online FPS games, one example is CrossFire. The Flaretech optical switch in Celeritas II has a resistance of 45g with a key travel distance of 2 millimetres and a linear profile. 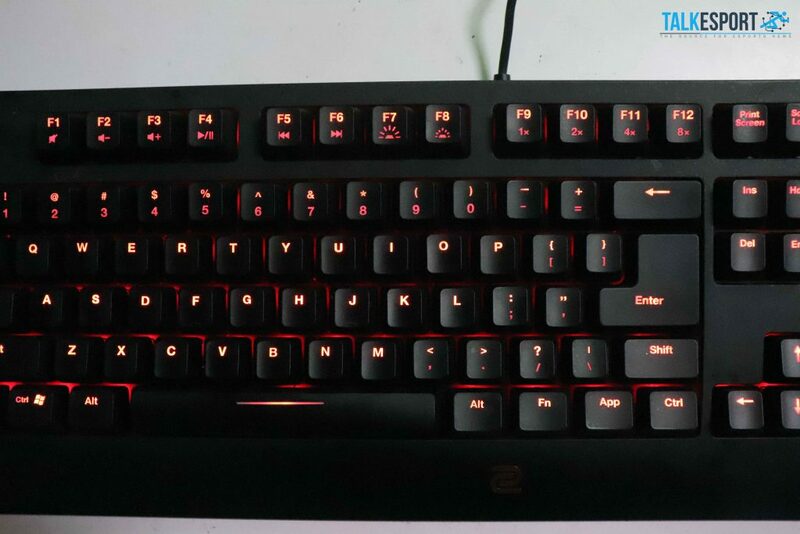 These characteristics place it almost equivalent to the Cherry MX Red mechanical switch. 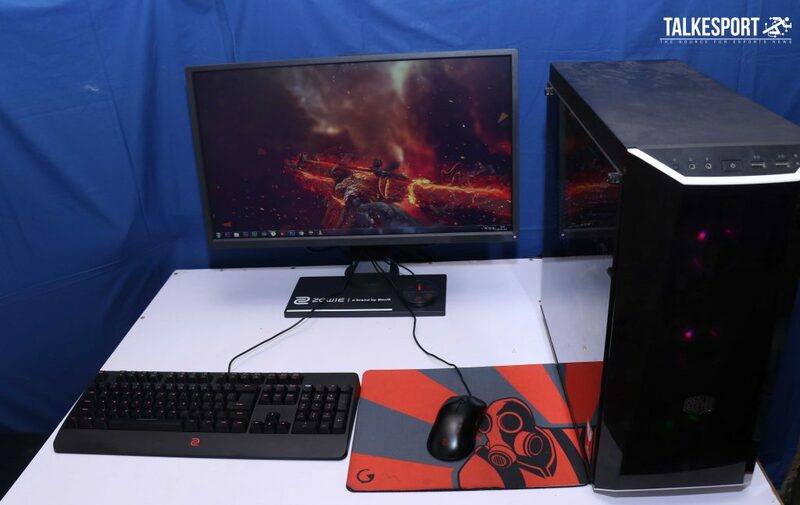 The fast response makes it very suitable for gaming. But interestingly, for me, Celeritas II is more comfortable for typing than the Corsair K95 – probably due to shorter key travel . During my long hours of continuous usage, grease marks did show up on the Celeritas II, and it actually created something like a heatmap on where my hands usually are. 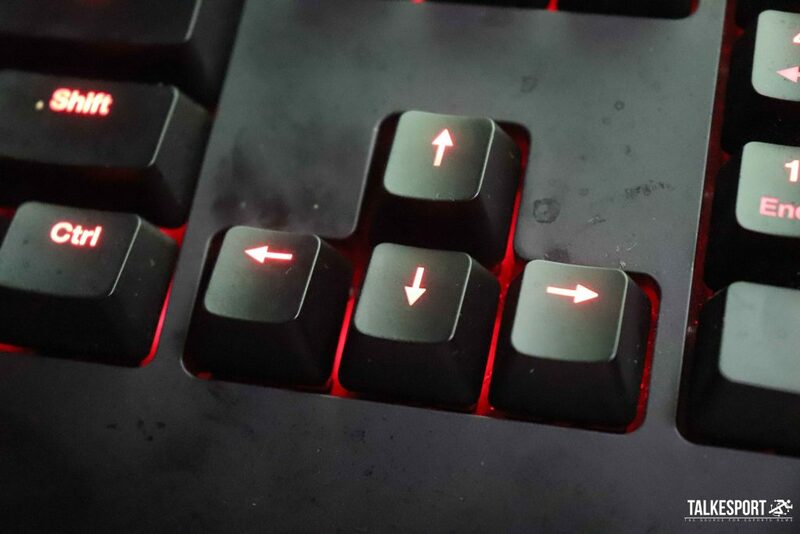 The Esc key and the area below the right Alt key is in different color as I sweated during my usage. Also, the area around the navigation cluster is covered in grease too – goes to show how much I actually use the Del and End key. Another weakness of Celeritas II lies in its weight. 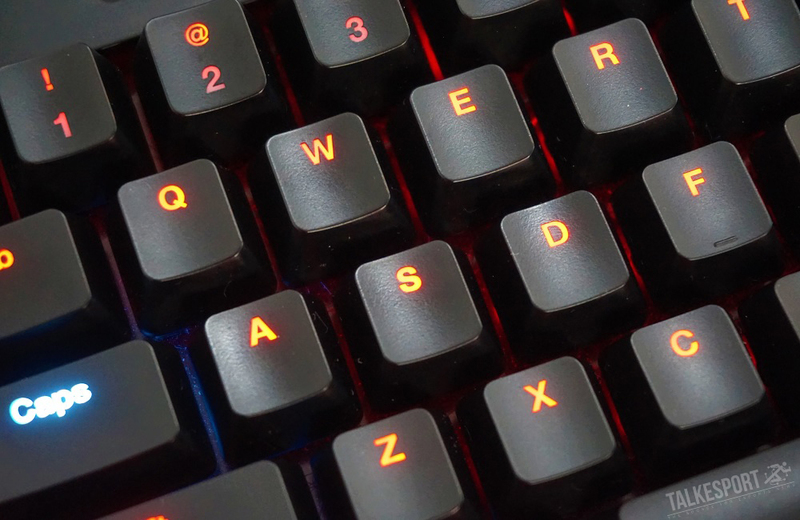 This gaming keyboard has a weight of 1.9 kilograms, and may add to the default burden for eSport athletes who have to move from one tournament location to another. 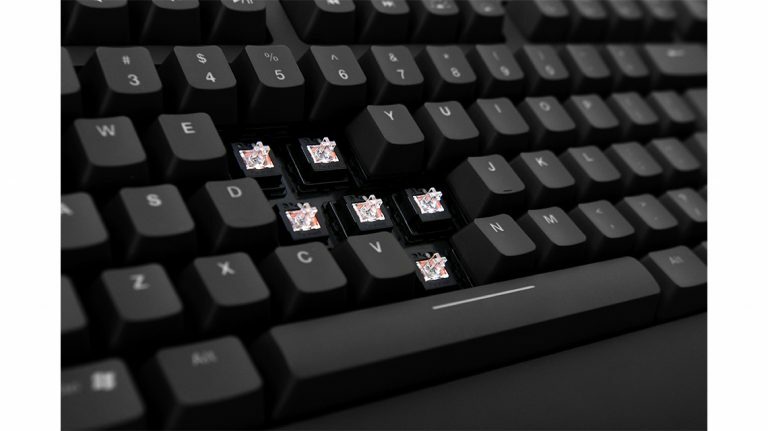 Actually, it would be even more ideal if Zowie also provided the option of a keyless layout. Zowie Celeritas II is a plain keyboard with no fancy lights at all. 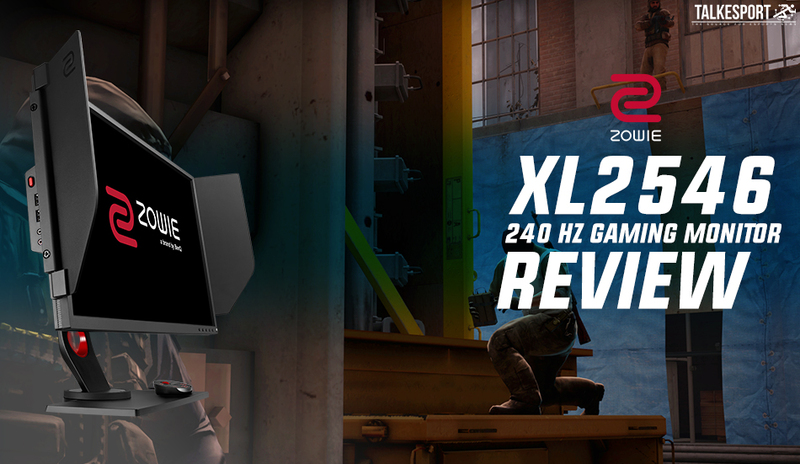 Last week we reviewed a Zowie XL2546 – a simple monitor that packs lots of features to improve your fast-paced viewing experience. ZOWIE only means performance and zero distraction – which does translate well to the Celeritas II. Now the question is, what kind of gamers are you? Do you want to be spoiled by features and appear ‘trendy’ like a modern gamer, or are you more concerned with high accuracy with minimal system error opportunities? If you choose the second answer, then Zowie Celeritas II is worth considering. I also gave a thumbs up to BenQ because through the use of optical switches, Zowie chose the direction of product development that was more difficult than its competitors. 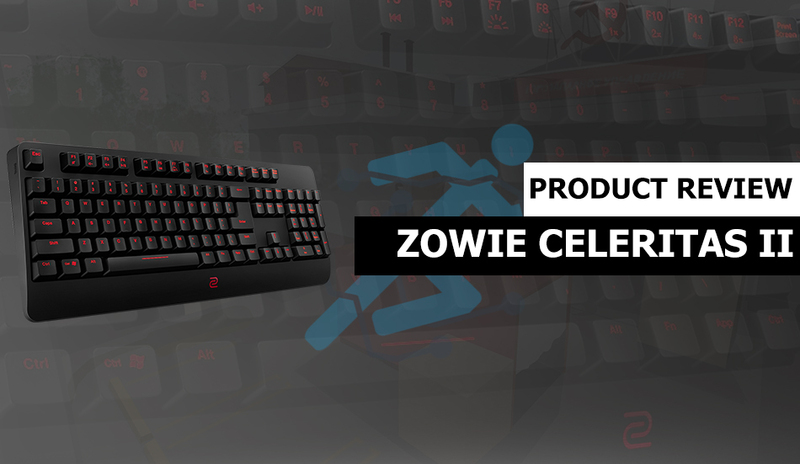 At last, the ZOWIE Celeritas II is made for eSports athletes. Easy to travel with, at LANs.